Am i wrong, or the lugs on this one are slightly asymmetrical? Thank you for your tip; that's the thread I was looking for. So is it fair to say that there are two Ministry case types? The "lugs on back" design is indeed very unusual, I have to think about that. To my eyes, it does not seem to be asymmetrical; it could just be the foreshortening effect of the picture. So is it fair to say that there are two Ministry case types? BTW, i have found two Vostok boxes with papers. Codes of the cases are 051 and 059, chrome and titanium-nitride. 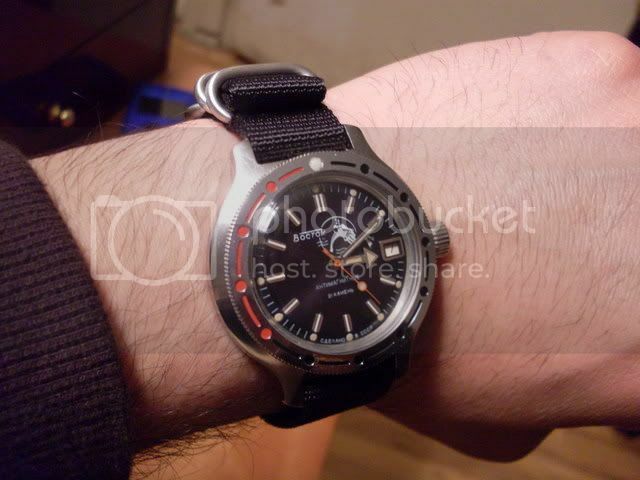 Both refers to a Vostok 2409 movement. Very intriguing indeed: makes me wonder what the watches actually look like! If i'm not wrong, the cases contained standard 34x Komandirskies, of course documents were not matching. Maybe the codes refer to the small "Cadet" model? Movement is that one, and they were available in chrome or titanium-nitride. As my original posts listing the Amphibia and Komandirskie case types are old enough not to allow me to edit anymore, I have to post the lists again with new revisions; here's the updated Amphibia list, updated Komandirskie list to come later. Amphibia models are with stainless steel case, and in Vostok's six-digit code, the third digit being "0" signifies that (although an exception has been found), and the first two digits indicate the actual design of the case. Additional notes in italics are more of less "points to investigate further" and I would greatly appreciate any help from fellow members. Characteristics: The lugs are formed in one piece with the case back. Note: this is a most unusual design found by member katolik. Originally a variant of the Amphibia case with a slightly oval shape, it is not yet known if the type number 930 was assigned at the time. First made with brushed finish and a variety of dials. Most are with 21-jewel automatic movements with date, Mark Gordon's 0280 is powered by a 2409, however. Later on, this case, with confirmed appellation of Type 930, was used in the Neptune series with a distinctive dial design, polished finish, and equipped with 31-jewel version of the automatic movement. This looks like another example of katolik's unusual case, again with date. (Ð§Ð°Ñ�Ð¾Ð²Ð¾Ð¹ Ñ„Ð¾Ñ€ÑƒÐ¼ Watch.Ru - Ð�Ð»ÑŒÐ±Ð¾Ð¼ TrushIN: ÐœÐ¾Ð¸ Ð’Ð¾Ñ�Ñ‚Ð¾ÐºÐ¸ - Ð˜Ð·Ð¾Ð±Ñ€Ð°Ð¶ÐµÐ½Ð¸Ðµ). And one more from Rastafar80 collection (http://photofile.ru/users/ussr-watch...#mainImageLink). The case looks black, why? Take a look also at the crown guards of this one (http://photofile.ru/users/ussr-watch...#mainImageLink), I wonder if it is Komandirskie or Amphibia (since it has the scuba diver on its dial). Last edited by storyteller; August 22nd, 2010 at 23:59. This looks like another example of katolik's unusual case, again with date. (Ð§Ð°Ñ�Ð¾Ð²Ð¾Ð¹ Ñ„Ð¾Ñ€ÑƒÐ¼ Watch.Ru - Ð�Ð»ÑŒÐ±Ð¾Ð¼ TrushIN: ÐœÐ¾Ð¸ Ð’Ð¾Ñ�Ñ‚Ð¾ÐºÐ¸ - Ð˜Ð·Ð¾Ð±Ñ€Ð°Ð¶ÐµÐ½Ð¸Ðµ). And one more from Rastafar80 collection (Êîëëåêöèÿ ÷àñîâ ÑÑÑÐ :: USSR watches collection). The case looks black, why? Take a look also at the crown guards of this one (Êîëëåêöèÿ ÷àñîâ ÑÑÑÐ :: USSR watches collection), I wonder if it is Komandirskie or Amphibia (since it has the scuba diver on its dial).